Recommended for me by cruise director, Peter Kissner, this excursion involves embarking on one of the local boats with a guide to venture along the passage through the reeds to the ancient city. 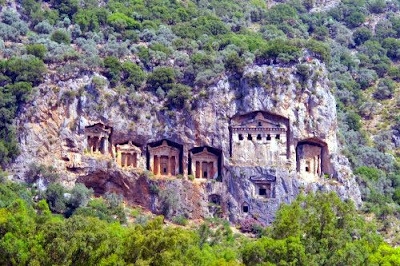 Kaunos was a city of ancient Caria and in Anatolia, a few kilometres west of the modern town of Dalyan, Muğla Province, Turkey. 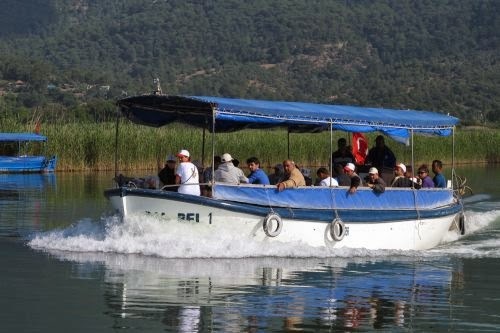 In the high season, as many as 12,000 guests can visit this delicate ecological region daily using as many as 500 of these excursion boats. Each of these little vessels seat 10-20 passengers. I'm told electric boats are planned to replace these using shielded propellers. Our guide is Şan (pron: Shon) whose family have been local fishermen for generations. Like so many places around the world, locals have been displaced by big greedy satellite-guided boats from who-knows-where which appear out of nowhere and haul in great loads of fish before disappearing and leaving fish stocks all but empty. Şan now supplements his family's income considerably by guiding in the mid-year season. 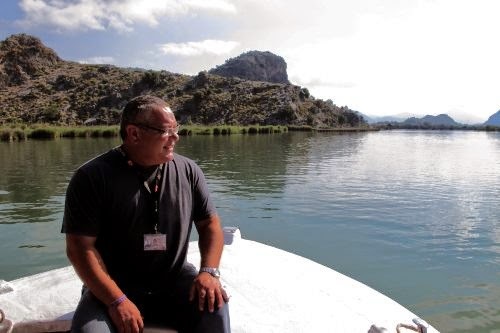 As a former Greenpeace activist, he is more than willing to share some of the challenges the community faces in dealing with the combined issues of ecological threats, mass tourism and development. 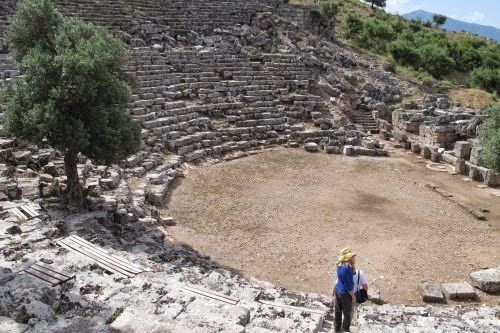 Already one major resort development has been thwarted and replaced by more manageable, low rise construction which is seeing people from all over Europe and the UK buying up the relatively cheap properties and spending months at a time in wider Dalyan region. The reed beds and marshlands are breeding and feeding grounds for loggerhead turtles which, I'm told, travel all the way from Mexico to lay their eggs. The clear, filtered waters also sustain mullet in sufficient quantity to maintain a small local fish farming industry that has been developed over many years. The village of Çandir supports about 100 families and appears to be thriving on the back of tourism. Şan expects the Arab countries to be supplying the next wave of tourists. Further along the river we go ashore to see the ancient ruins of the old port which contain remnants of both Greek and Roman periods with some portions dating back as long ago as 2500BC. There's an amphitheatre, a windmeter and stunning rock tombs above the town which to the untrained eye would look for all the world like those in Petra, Jordan. Before we head back to Star Clipper, some guests go ashore on the sand spit for a bit of beach time, while elsewhere there are kayaks and paddleboards provided by the ship's watersports team. Today's alternative shore excursion was to the local mud baths which also included a bit of interpretation along the same river, but I'm content in my choice and have benefited enormously from genuine local insight from Şan and feel the satisfaction of an authentic local connection. Rod travelled as a guest of Star Clippers and Cruise Express.